Tim at a return mission to Cambodia. 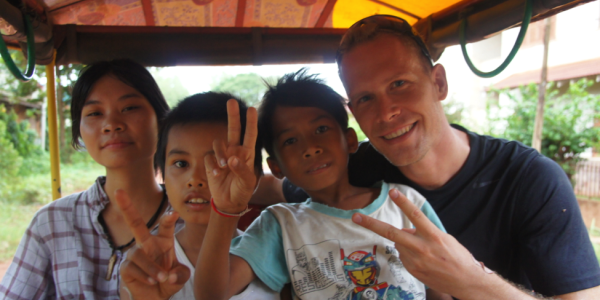 In 2012, Tim took a trip to several Southeast Asia countries. While backpacking through these places, it opened his eyes to the poverty stricken communities where he became inspired to provide some form of assistance to the poor. 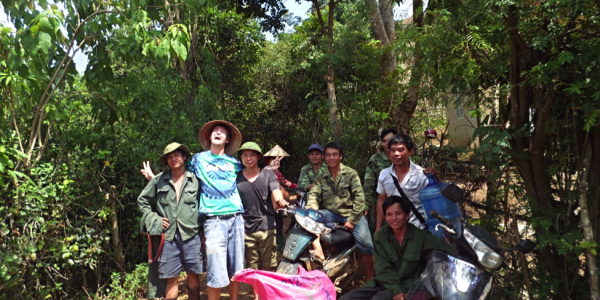 After helping out in a rural village during his trip to Cambodia in August, he decided that a sustainable route of providing support is needed. Hence on 21st December 2012, the Feed Starving People (FSP) was officially incorporated through the state of Georgia. In showing commitment, Tim put in 40-60 hour work weeks for 4 months and raised $2000 for Feed Starving Peopl’s first official mission to be in India for the month of March 2013. Local team of FSP in India. The first destination after the establishment of Feed Starving People was a one-way trip to Delhi, India. Through FSP’s pictorial blog, the mission touched the hearts of many people. With raised awareness about FSP, more donations came which helped to support subsequent missions in Vietnam, Thailand, Laos, Cambodia and Philippines. Tim built close connections with a handful of locals in the countries that FSP served. Tim worked closely with these locals – They often have the best knowledge about the regions of poverty that needed FSP’s support. They also played an important role in communicating with the communities that FSP served – To understand the communities’ needs, and to cater uniquely to their needs (Be it food, clothes, or other supplies). The connections with the locals in each city were established as a foundation for points-of-contact for FSP. 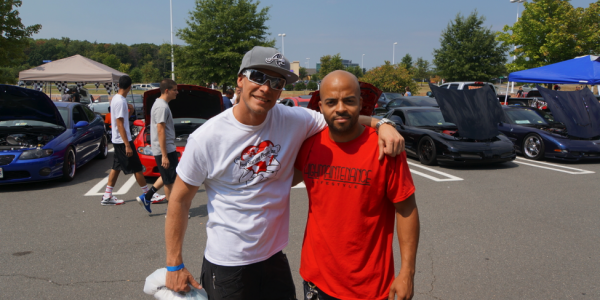 Over the months, FSP built a team of dedicated volunteers. Some of these volunteers returned to communities that FSP has served, and worked closely with FSP’s points-of-contact (POC). Mr Bruce Lawson (Kentucky, USA) worked together with Miss Lan Anh Ngyuen (POC) in a return mission to Northern Vietnam, while Mr Adam Buxton ran a return mission to Bangalore with Miss Latha (POC). The efforts of FSP’s volunteers, in collaboration with the various points of contact, allowed return missions to communities that FSP previous served – This was aligned with FSP’s mission to providing a long-term & sustainable assistance for the needy communities. Team members and helpers after a successful mission. At the same time, other volunteers initiated missions in new regions – Mr Preston Charles (New York, NY) led a mission in Siem Reap, Cambodia, for the Best Way for Children Organization, while Miss Wei Qi (Singapore) ran a mission in Guadalupe (Cebu City, the Philippines). This allowed Feed Starving People to reach out to more poverty stricken communities. Currently as FSP’s director, Tim has returned to Washington D.C. to build support networks and raise funds. FSP is still waiting for the IRS to approve the 501c3 tax-exempt status. In September 2013, a fund raising event was organised in collaboration with Triple OG, High Maintenance (car show teams) & Mohawk Riders (Motorcycle club). FSP is currently at 20% of the fundraising goal in order to meet the operational needs for the next missions. For the upcoming events, we hope to continue to increase public awareness on FSP’s causes, and continue raise funds that are needed for subsequent missions. In projection to 2014, FSP hopes to narrow its services to five main areas namely, Bangalore India, Siem Reap Cambodia, Son La Vietnam & Lao Cai Vietnam(northern VN), and Dong Thap in southern Vietnam to better develop focused long term projects and provide sustainable support in these communities.